Seeing their first commercial release nearly five decades after they were first recorded, THE WITMARK DEMOS feature 47 Bob Dylan songs accompanied only by his acoustic guitar, harmonica and occasionally piano. Recorded for his first music publishers between 1962 and 1964, these recordings trace Dylan’s dramatic growth as a songwriter from early traditionally-styled songs through social commentaries and ultimately to groundbreaking lyrical genius. While many of these early songs on THE WITMARK DEMOS found their way onto Bob Dylan’s own albums, 15 have never before been officially released and several more were made famous by other artists, including Peter, Paul and Mary and Stevie Wonder (“Blowin’ In The Wind”), Judy Collins (“Tomorrow Is A Long Time”) and The Byrds (“Mr. Tambourine Man”). 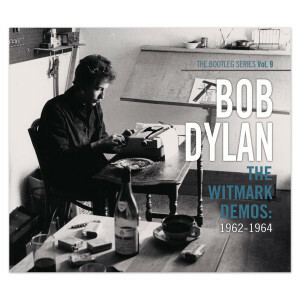 THE WITMARK DEMOS also feature a deluxe booklet with in-depth liner notes by noted music historian Colin Escott, as well as rare photographs of Bob Dylan captured during the same period as these early recordings.Together with The Original Mono Recordings , THE WITMARK DEMOS provide a wide-ranging view of Bob Dylan’s work during the 1960s, and chronicle his amazing evolution from fledgling songwriter to one of the world’s most inventive and singular recording artists.